Anchor port: Anchor ports are ports that are not wheelchair accessible. In order to get to shore, small boats are taken from the ship to the port. The tender dock is in the center of town. Video of Rapallo and nearby places worth visiting. Overlooking Rapallo harbor is a small castle originally built to defend against pirates, today it welcomes visitors from all over the world to this pretty Italian resort. Situated in a sheltered spot on the Golfo del Tigullio, the town, which is famous for its lace-making, is a year-round destination thanks to its temperate climate. Rapallo is the largest Italian Riviera seaside resort town. There's a picturesque castle in the sea, a small harbor and seaside promenade, pedestrian shopping streets in the historical center, and good seafood restaurants. Don't miss the funicular ride up the hill to Montallegro. The spectacular ride up the hill to Montallegro on the funivia , or cable railway, takes eight minutes. It leaves every half hour between 9:00 - 12:00 and 2:00pm - 5:00pm (later in summer) from Piazza Solari. The cable is 2349 meters long and ascends 600 meters to Montallegro where there are beautiful views of the gulf and the hills. At the top is the large Sanctuary of Montallegro, built in 1558 to commemorate a picture left by the Virgin when she appeared to a peasant. Its marble facade was added in 1896. On the walls inside are many offerings, mostly for miracles at sea. 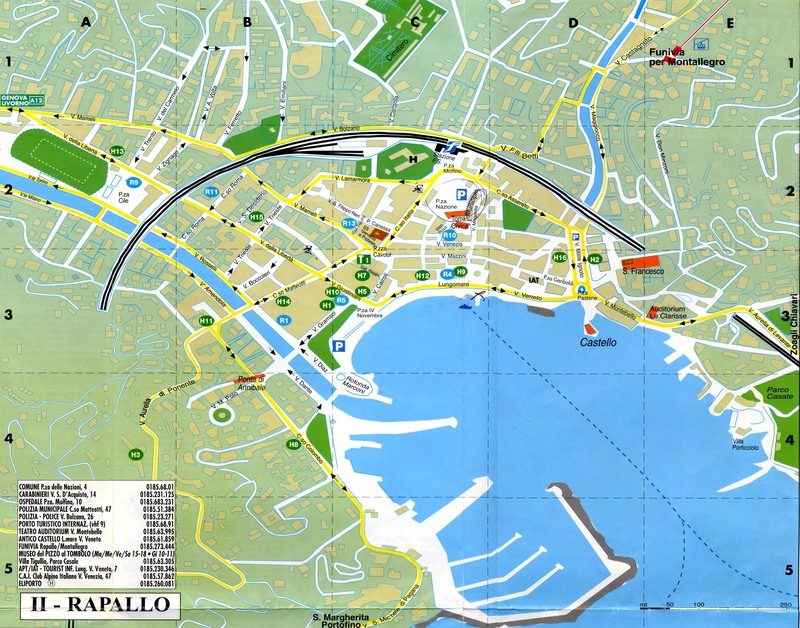 Rapallo is on the coastal rail line that runs from Ventimiglia (near the French border) to Rome. The train station is centrally located. Buses connect Rapallo to many smaller towns both on the coast and inland. Seaside Promenade - Lungomare Vittorio Veneto, a traditional red-brick promenade lined with palm trees, skirts the semi-circular harbor. Along the promenade are art nouveau buildings, restaurants, bars, and hotels. In summer small music groups sometimes perform in the early 20th century band shell, Chiosco della Banda Cittadina.